From the Stranger Things collection by Funko. Stranger Things 8 Inch Super Cute Plush Display Case. From the Stranger Things collection by Funko. 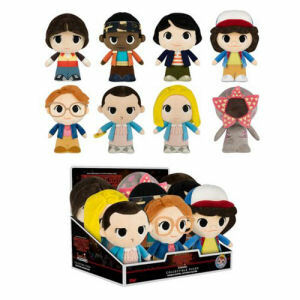 Stranger Things 8 Inch Super Cute Plush Display Case. Display Case includes 9 plush - 2 Eleven with Eggo - 1 Eleven with wig - 1 Demogorgon - 1 Barb - 1 Dustin - 1 Mike - 1 Lucas.